Remember when Obama claimed that there wasn’t a spending problem in Washington? 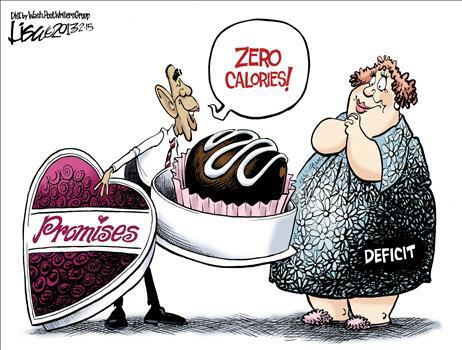 Cartoonists had a field day, portraying the President as an in-denial spendaholic. But perhaps Obama was right. Not in the way he thinks, to be sure, but perhaps it’s better to categorize Washington’s spending binges as an eating disorder. Or, to be more charitable, as a form of gluttony. We’ve already explored that theme in this cartoon about redistribution, as well as this cartoon about the VAT. And that’s the point of this new Lisa Benson cartoon. 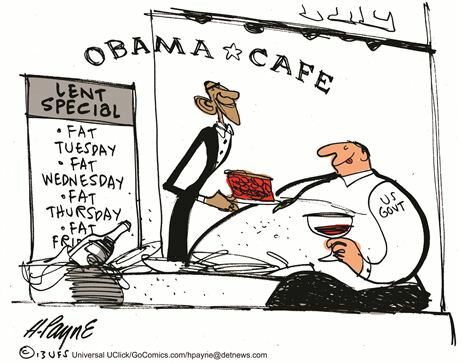 As you can probably guess, I wish the plus-sized lady was labeled “big government” or “government spending,” but it’s still a good cartoon. Henry Payne has a similar message in his cartoon, and I like it even better because it’s obvious that the problem is that government is too big. If you like the gluttony genre but prefer monsters instead of people, this cartoon about spending and the fiscal cliff is worth sharing, as is this cartoon about class-warfare taxes and the deficit. Cankles, get your cankles while you still can!